Get a brighter, clearer skin tone using Mirabelle in Korea. 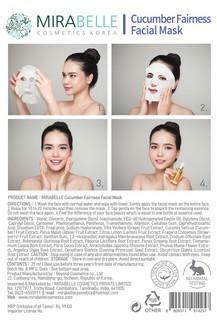 Cucumber Fairness facial mask. It is a perfect remedy for your oily and dull skin. Contains mixed extract of Cucumber, Pumpkin and Apple. Allows moisture to pass through the skin and keeps the skin tone clear and bright. For clear and bright skin tone use this Cucumber Fairness facial mask.